Select Continuous or Discrete. Continuous distributions will be sorted in ascending order using the Anderson Darling goodness of fit statistic. Discrete distributions will be sorted with the Chi-Square goodness of fit statistic. P-Values and distribution parameter values are also reported for each distribution. Check Exclude Threshold Distributions to run the batch distribution fit without estimation of distributions that have a Threshold parameter. The default is checked because it is much faster. Note, however, that if the data contains negative values then Threshold distributions will be included in the batch fit. Tip: If Threshold distributions are included, and two candidate distributions with similar Anderson Darling statistic values are being considered, one with a Threshold and one without, choose the simpler model without the Threshold. For further details on Threshold distributions and estimation, see Appendix: Distribution Fitting – Threshold Distributions. Select All Distributions or Automatic Best Fit. Automatic Best Fit will return the distribution with the lowest Anderson-Darling or Chi-Square statistic. 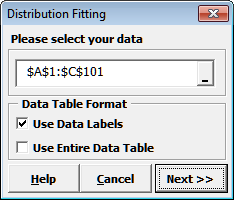 If distribution fitting has been performed, the Select Stored Distribution Fit option will become available in the Input Distribution dialog for selection of variable name(s) and stored distribution(s). The input distribution parameter values will automatically be populated. See Case Study 1 – Basic Profit Simulation for examples of Batch Distribution Fit. Specified Distribution Fit provides a more detailed distribution fit report for a selected variable and specified distribution. 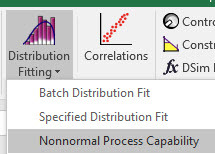 Select Distribution Fit Variable and Select Distribution provide a drop down list with available variable/distribution options from the Batch Distribution Fit (similar to Select Stored Distribution Fit in the Create/Edit Input Distribution dialog). Histogram and Probability Plot (optional with check box). Parameter estimates, standard errors (SE Estimate) and confidence intervals for parameter estimates. The Confidence Level can be set in the dialog above with default value = 95%. In some cases standard errors and confidence intervals may not be available. Percentile Report with the following percentiles: 0.135, 1, 5, 10, 15, 20, 25, 30, 35, 40, 45, 50, 55, 60, 65, 70, 75, 80, 85, 90, 95, 99, 99.865. Other values can be added by entering in the Estimate Percentiles box. Note that the percentiles are computed using the distribution and estimated parameters, not the empirical data as is the case with the percentiles in the simulation report. Standard errors and confidence intervals for the percentile values, at the Confidence Level specified above (95% default). Model Summary and Goodness-of-Fit statistics. 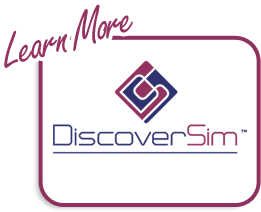 See Case Study 1 – Basic Profit Simulation for examples of Specified Distribution Fit. 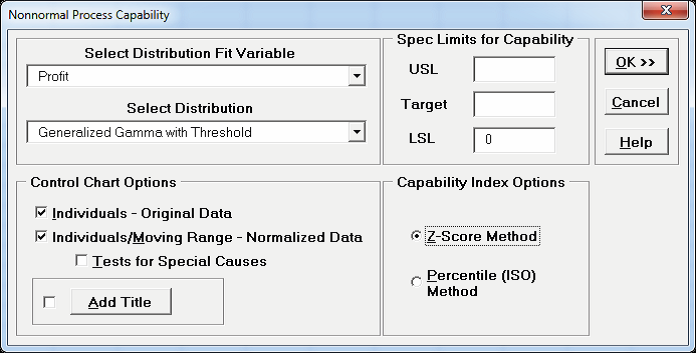 Nonnormal Process Capability provides a nonnormal process capability report with capability indices computed from the specified distribution with estimated parameters. Empirical Performance is also reported for comparison. Capability indices are for individual observations (subgrouping is not available). 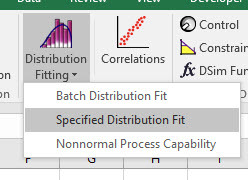 Select Distribution Fit Variable and Select Distribution provide a drop down list with available variable/distribution options from the Batch Distribution Fit (similar to Select Stored Distribution Fit in the Create/Edit Input Distribution dialog). Enter Upper Specification Limit (USL) and/or Lower Specification Limit (LSL). Target is optional (used in the Cpm calculation). For details on Z-Score versus ISO methods and Control Charts see Appendix: Distribution Fitting – Nonnormal Process Capability Indices and Distribution Fitting – Nonnormal Control Charts. Standard formulas for Process Capability Indices are given in the Appendix: Formulas for Quality and Process Capability Indices, but note that indices here use the specified distribution, not the normal distribution. 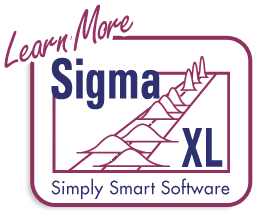 See Case Study 1 – Basic Profit Simulation for an example of Nonnormal Process Capability.